4.10.8.1 What is an email fax service? 4.10.8.3 Which email fax services are supported? When your ChamberMaster software if first installed, one or more users will be designated as Administrator. These individuals should ensure that your database is configured with some basic settings. As you continue using your software, you may desire to customize many different settings such as Custom Fields, Online Event Calendar preferences, and Member Information Center options. The ChamberMaster/MemberZone support team works with your association as your data is converted and imported. Many items will already be customized to you. However, having a comfort level with viewing these selections and knowing where to change them if needed may be desired. Information in these fields will be the default business information displayed within your software and on certain integrated web pages. Click Setup in the left-hand navigation bar. Click Association Information in the Association Options area. Edit the desired fields on the General Association Information screen. Ensure your association's name and address is complete and accurate. This address is used where addresses are automatically pulled from the database. For example - it will be used on the default invoice template. Select the correct country and time zone. Update your phone numbers and website. Enter in your association's generic email address. NOTE: This email is used when automatic emails are sent from the database as the from address. Upload your association's logo for display at various places through the software. See Upload Your Logo for details. Your association logo will appear at designated areas throughout your integrated website and in the Member Information Center if you have it uploaded. If using Integrated Billing, it will also display automatically on default Invoice templates. Click Setup in the left-hand menu. Click the + (plus sign) in the Business Logo area. Click the + (plus sign) to browse your drive for the desired image. Note: The folder path that is displayed here is not significant and is not accessible at this time at any other location in the software. Future plans are that these images should be accessible at a common location so they can be used throughout the software. This folder is not visible in the Cloud Drive at this time. You are not able to navigate up to any other folder from this location. Once you’ve selected (clicked) the desired image, click Upload. Click OK on the successful message. Click the desired image Name in the list. Position the selection window around the area of the image that you’d like displayed. Many settings in this area have been preset based on your individual configuration with ChamberMaster. You may not have to change any selections shown here. Contact Customer Support if you are unsure of the effect of changes. If making any changes, please record the current settings before making any modifications. Click General Options & Settings in the Association Information area. Auto-update representative contact information when updating members': This will default to on for new associations. Existing associations will have to check to select this option so that individual representative information will automatically update when matching member information General tab is updated. When the member's address, primary phone or fax number is updated and it exactly matches the representative's address, work phone or fax then the matching representative(s) field(s) will be updated as well. Member created the content, no primary rep designated: Member is recipient. Member created the content, 1 or more primary rep designated: Primary rep(s) is recipient. Note: if a valid email address is not associated with the rep or member, then no email will be sent. Default Member Status: When new members are created by clicking the Add button on the toolbar, the Status drop-down will have the default status selected here. Choices are: Active, Courtesy, Non-Member, Prospective, or Dropped. Newsletter Solution: If you have a subscription to Constant Contact, select Constant Contact. 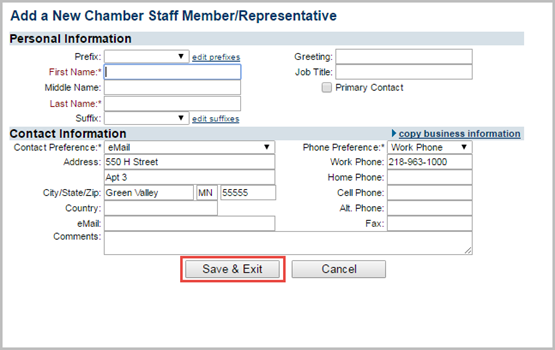 This will display Constant Contact menu choices within ChamberMaster/MemberZone. Note: Also complete the Constant Contact section in the Add-On Manager area below. Active Social Network Services: This will display the Social Networks that you have enabled. Click the edit social network services link to add or delete social networks. Allow representatives to create a login/password from the Login screen: When this option is selected, a No Log-in created? Sign Up Now link will be displayed on the MIC log-in page. After clicking to Sign up now, the rep enters their email address. If their email address exists in your database, on only rep, a verification email is sent to that address where the Create Account link is provided. Last Name is requested if the rep email exists more than once on a single member. If their email address does not exist in your database, they are advised to contact your organization for additional information. Redirect /login page to the https:// secure version: With the January 2017 release of Chrome version 56, we are making an SSL login page available for your members - to be enabled at your discretion. As a trusted voice to your membership, we are allowing you to enable this secure login page when you desire since we realize that a redirect from a familiar login page to a different-looking login page could cause concern without proper warning. Use drop-down lookup list that is optimized for a larger number of records: Select this option if you wish to use the type-ahead search result that not only displays results that match the "start of the record" but also displays those that match 'any part of the record name". Info Request Release Disclaimer: This is the message that displays on your Info Request page. Info Request - Thank you Message: This is the text that will appear in the browser after someone has submitted an info request. To use the archive feature, you must be sending the email from an email address that is listed as a staff email address. Emails forwarded or cc'd to archive@youraname when multiple members/reps in your database share the same recipient address will be recorded in Communication > Unmatched Archive Emails. In cases where there are two reps with an identical email address that belong to the same member, it will be recorded on that member’s history. In cases where two reps with identical email address belong to two different members, the archived email will still go to the unmatched archive email list. SPF Record check prior to sending email: Select this setting if you have properly configured your SPF record with the appropriate entry. See details on how to do that here. If this setting is enabled, emails that are sent through your database will only be sent on to the recipients after being checked against your SPF record. Having this extra check against the SPF record will eliminate scenarios where someone maliciously sends an email making it look like the email came from you but really was sent from another IP address. This extra check will verify that the sender of the email is truly from your domain. Opt-out message display at the bottom of emails sent from groups. Default messages have been configured for you, but you may customize them as needed. Setup > General Options & Settings > Email Relay Service. Internal Email Disclaimer:appear on emails sent from inside the database, typically emails sent from you to your members. Disclaimers do not appear on the bottom of emails sent using the “Send with Outlook” selection. Public Email Disclaimer: Click Here for details of the Public Email Disclaimer messages. API Access: An Application Programming Interface (API) is available to 3rd party developers that wish to create their own applications from your database. If you have someone wanting to develop a special-use application for you, contact support@growthzone.com to receive a unique API key for your developer and the API documentation. Access is only granted to a 3rd party developer with your express permission. AccuWeather: If you will include the weather module on your web-site, enter the zip-code to be used in gathering weather information. ConstantContact Integration Setup: If you have a subscription to Constant Contact, record your subscription login and password here. Having the login credentials recorded here will allow automatic opening to your Constant Contact account from certain menu selections in ChamberMaster/MemberZone. For example: Communication-> Newsletters/Email Campaigns. To also allow ChamberMaster/MemberZone to automatically update your Constant Contact lists, select one or both of the synch checkboxes. See Enable Constant Contact Synchronization for more information. Fax Solution: If you have a subscription to an Internet Fax Service, select that here and record the appropriate email addresses. These settings allow you to configure ChamberMaster/MemberZone to use your fax server. When sending letters, and designating that communication is delivered via fax, the appropriate output will be sent to your selected email fax service who in turn will deliver it to your fax recipients. LiveEdit: If you are using LiveEdit as your Content Management System, record your login credentials here. This will place a shortcut button on your toolbar to allow quick access to edit your website. See Enable LiveEdit button for more information. Votility Integration Settings: If your organization uses Votility you can integrate your Votility account with your ChamberMaster or GrowthZone account. This provides a more seamless experience for your members by enabling them to access Votility directly through the Member Information Center without them ever needing to create a separate login or account on Votility. (requires Member Information Center v4). To integrate Votility you simply need to supply two pieces of information from your Votility account: Your Votility Organization ID and your Votility API Access Key. To find this information, log into votility enterprise management and use the navigation links on the left to find the "API Settings" page. From that page, copy your Organization ID and API Access Key to these boxes and click the Update button. This will complete your integration, enabling a link to Votility in the Member Information Center for your members and an Administrator login link on the backoffice dashboard. Within the Security & Privacy Settings you can set optional password requirements as well as configure optional terms and conditions that your members must agree to to apply for membership and access the MIC. These settings are optional and comply with GDPR. Password requirements are optional. If enabled, these settings are enforced at all locations where passwords are created for member logins (i.e. 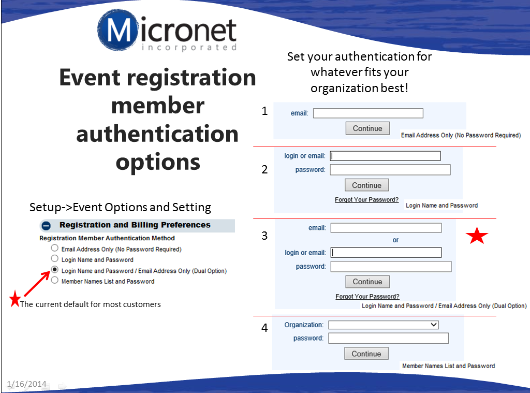 MIC login page, Membership Application, Event Registrations, etc). NOTE: When you make changes to password requirements, existing users aren’t affected until the next time they change their passwords. Select Setup in the left-hand navigation panel. Click General Options & Settings. 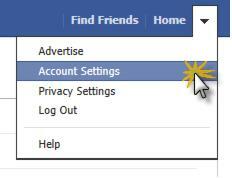 Expand the Security & Privacy Settings section. To require specific password conventions, click Enable Password Requirements. Required Password Length: The minimum number of characters required for a password. The default is 8 characters. Required Alphabetic Characters: Enter the minimum number of required alphabetic characters. When this is populated, the Required Capital Letters field will be enabled. Required Capital Letters: Enter the minimum number of required capital letters. Required Numeric Characters: Enter the minimum number of required numeric characters. Required Special Characters: Enter the minimum number of required special characters. All standard keyboard characters are allowed. Set the number of days after which a member must change password in the After "x" days text box. Set an exact date on which the member must change password in the On a specific date text box. Using this option might be beneficial if you have made recent changes to your password requirements, and want to ensure that all members are forced to update their credentials by a specific date. Set Password Reuse: If you to ensure that the new passwords created by the user are unique, you can set the number of previous passwords that may not be reused in the Do not allow reuse of the last <1-4> password text box. Valid values are 1, 2, 3, 4. NOTE: When Force Password Expiration settings are enabled, the user will be given the option to reset their password as soon as they are notified, or they will be able to click ‘’’Later’’’. If ‘’’Later’’’ is selected, the next time the user logs in, they will be prompted to change their password and will see the number of times they can hit later again. Click Save if you have made changes. NOTE: In addition to setting password requirements, when Enable Password Requirements is checked, all locations where a password reset link is sent out, an expiration is set on the link (24 hours), with the exception of the initial email sent to a new representative with instructions to create their user name and password. Type Privacy in the Search by Keyword text box. (Optional) Agreement Version: You will select an agreement version by the date it was created. Clear the None check box, then type the desired date in the <Chose Date> text box. You may save the report in Excel or CSV format. Our support team will provide your initial login name and password for a single staff person. Additional login names and passwords may be created at your convenience under Setup > Employees/Reps. Default address, phone number and email address information for each staff person are modified here as well. You will assign a certain level of permission to your staff based on their need for access to financial information, administration tools and basic member information. Receiving the highest permission level of Administrator gives the ability to modify any of the settings in your software – including the ability to add/remove other staff logins and assign different permission levels. Standard User: Staff/employee with all rights except ability to modify Setup selections and access the QuickBooks or Billing menu. Standard User permissions still allow the ability to view invoice and payment activity on the members’ account. Disabled: Staff/employee with this permission level will not be able to login to the software. 1. Click Setup in the left-hand navigation bar. 2. Click Association Employees/Reps in the Association Options area. 3. Click Add a New Rep.
4. Complete the Personal Information and Contact Information sections. Note: The Email Address recorded here should be the same email address that is used when accessing your own email program. If correctly specified, then using the options in software to "Email from Outlook" will not give an error. See Email Sending Options for more information. Note: The First Name and Last Name fields (with a space between the 2 fields) will be what displays in the “From” line in the recipient’s email inbox. 5. Click Save & Exit. 6. To create a login account for this staff user, click their name in the List of Representatives, expand the Permissions for... section and click Create Login Account. 7. Complete the Login Account and Database Permissions sections and click Save. Note for Users of SmartCMS: A staff user's permission for SmartCMS are also configured in this section. Note: To edit a staff user's email notifications, expand the Additional Settings For... section and select the desired options. Click Association Employees/Reps in the Association Options area. Select the Employee you wish to set email notifications for. 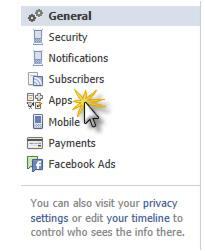 Expand the Additional Settings For... section and select the desired notification options. Click Setup in the left-hand navigation menu. Click Association Employees/Reps in the Association Information section. Edit the Login Name, Login Password, Permission Level fields in the Permissions area as desired. NOTE: If this staff has login access to another ChamberMaster/MemberZone database or has a rep login/password on a member account, see Joining Login Names for more information. When a staff member leaves your chamber/association, you may remove or deactivate them in the database. Click Association Employees/Reps in the Association Options section. Click the check-box next to the staff member you wish to de-activate. Set rep as inactive and leave in current groups - select this option if you wish to deactivate the staff member, but allow them to continue participating in the groups they belong to. Set rep as inactive and remove from groups - select this option if you wish to deactivate the staff member and no longer wish them to belong to participate in groups. This will remove them completely from ALL groups. If you wish them to remain in some, but not others, you would need to add them back to specific groups in the Groups module. Set rep as inactive and inactivate in groups - select this option if you wish to deactivate the staff member and deactivate them in the groups to which they belong. Deactivating in a group allows you to keep them in the group, but they would not receive any of the email notifications sent to the group. that they belong to participate in groups. This will deactivate them completely from ALL groups. If you wish them to remain active in some, but not others, you would need to add them back to specific groups in the Groups module. Delete rep records and remove from groups - It is not recommended that you delete staff members as there is historical information maintained in the database that would be lost if you deleted the rep.
Click Continue. The staff member will now be displayed as inactive in the List of Representatives. NOTE: The log-in credentials (user name and password) for the staff member are retained. However, Database Permissions and SmartCMS Permissions (if applicable) are disabled. If a previous staff member returns to your organization, you may easily reactivate them. NOTE: If you have deleted the staff member completely, you are not able to simply reactivate him/her. You would need to add him/her back as a new staff member. Click the name of the staff member you wish to reactivate. 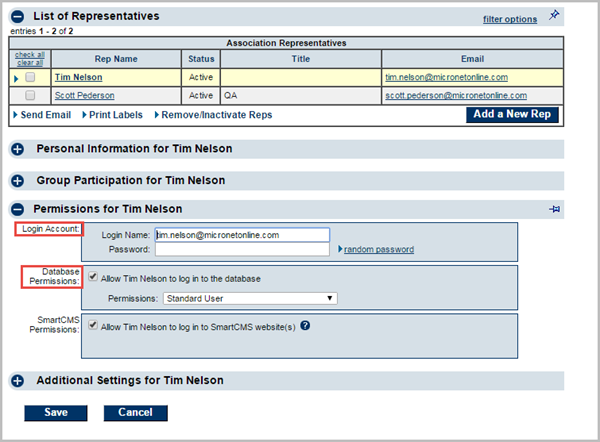 In the Personal Information section, click the check box next to Rep is currently active with the chamber. 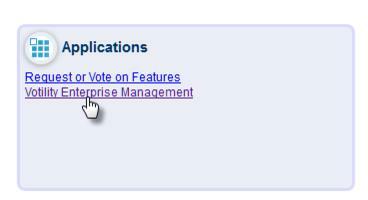 In the Permissions section, click the check box next to Database Permissions and SmartCMS Permissions (if applicable). Business Categories are used to group related members by their business type. Categories should be broad enough to encompass multiple members but specific enough that visitors can drill down to the member that they're looking for. See Example Category and Quicklink.pdf for a list of sample directory categories. 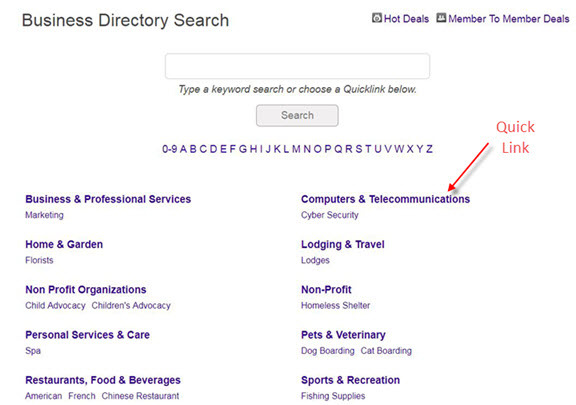 Directory QuickLinks are the main categories (displayed in bold) within your directory. Your software has been populated with the industry standard links. You may add additional QuickLinks as needed. Click Define Directory Categories in the Member Options section. Scroll to the bottom of the list of categories and click the QuickLinks Categories link. Scroll to the bottom of the list, and click the Add a New QuickLink Categories link. Enter a Name for the new quick link. Users of the v4 Public Modules can add images to the QuickLinks. Click Define Directory Categories in the Member Options area. Click the QuickLink Categories link at the bottom of the page. For the QuickLink to which you wish to add an image, click the Add Image link. Click the + sign to upload the desired image OR select one of the images provided in the software. NOTE: Only images for QuickLinks to which categories and members have been associated will display on your directory. Modify the categories as desired. Be sure to assign a QuickLink to each and every category. See QuickLinks for more info. Did you know... You can generate the Directory Category & Attribute Assignments Report to view a listing of all of your members filtered by category. Click Here to view the report. Tip:If you have more than 300 categories – see this video to see how to edit your category names and QuickLink assignments by clicking Edit in the far right column. Sub-categories may not be created in top-level categories when the top-level contains members. Remove the members, then sub-categories may be created. QuickLink categories should be assigned to every top-level and sub-category to take full advantage of all search methods available on the integrated public web site. Click Point of Interest Categories to assign Point of Interest categories (POI) to your categories if you will be using applications such MyChamberApp. You may add additional directory categories to meet your business needs. Click the Add a New Top-Level Category at the bottom of the screen. Enter a name for the category in the New Category Name text box. Select the QuickLink this should be associated to from the Associated QuickLink drop-down list. You can add Category Attributes to any directory category to further identify the characteristics of your members. For example, for restaurants, you could specify an attribute group called "Cuisine Type" with attribute tags of "Italian", "American", "Mexican", etc. and another group for "Average Entree" price. 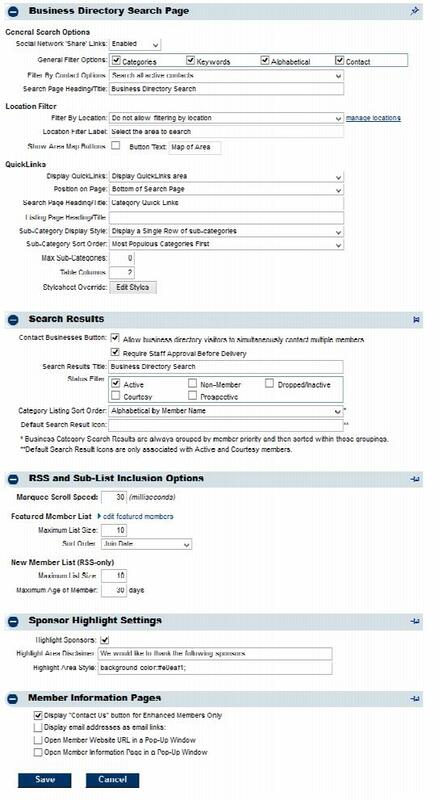 You Member Directory can then be searched by these attributes. NOTE: Attributes will only display on the public website for those with 3.0 SEO website modules but staff with any website module version may enter and apply these to your members, allowing preparation of your member data prior to upgrading to the 3.0 modules. Not sure which version you have? Select "View Website Integration Instructions" from your Dashboard. Your module version will display in the heading at the top of the screen. Contact Customer Support for assistance or with questions. For the desired category, click the add attributes link in the Attributes column. Click Add Group. A group which will contain similar attributes must first be created. For Example: You can create a group called price, then add '$', '$$', '$$$' attributes. Enter the name of the group in the New Group Name text-box. Click the green check-mark to save the new group. To add attributes to the group, click the + sign next to the name of the group. Enter the name of the attribute in the New Attribute Name text box. Click the green check-mark to save the attribute. Repeat steps 6 - 8 above to add additional attributes. Click Close when all attributes have been added. If category attributes have been added to a business category, then they may be assigned to your member on the Advanced</span> tab. 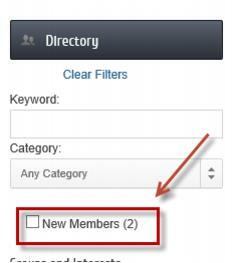 Attributes allow online directory visitors to narrow their search for your members within the specified category. On the member's Advanced tab, click the new window symbol that follows the category name. Click the + sign on the desired attribute group to view the available attributes. If no attributes are available, you will see a message “There are no attributes available for this category”. Create attributes under Setup-Define Business Categories. This member will now return in the online directory search results when the selected criteria is searched. Note: Attributes will only display in the online directory for those with 3.0 SEO website modules, but staff with any website module version may enter and apply these to your members, allowing preparation of your member data prior to upgrading to the 3.0 modules. If you are using services such as MyChamberApp, Point of Interest categories must be assigned to your business categories. 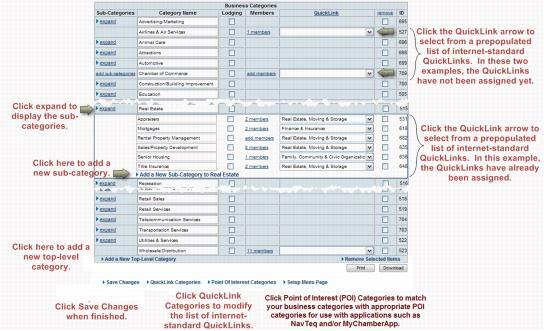 The simplest way of assigning these categories is to assign the Point of Interest (POI) categories to your QuickLinks using the QuickLink Categories selection. Note: QuickLink categories must be assigned to your categories first. See Assign QuickLink Categories. If there are certain business categories that will not be assigned correctly using this method, then these categories may be assigned more specifically by assigning Point of Interest categories directly to your business categories using the Point of Interest Categories selection. Finally, if a certain members require an even more unique assignment, then assign their specific POI category on the Members Web tab-Search Results Map Information area. Click Define Business Categories in the Member Options area. Click QuickLinks at the bottom of the screen. Click Point of Interest Categories at the bottom of the screen. 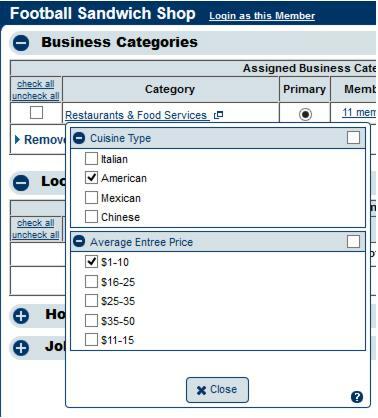 Click the Point Of Interest drop-down arrow and select the desired POI category for each of your business categories. Select the desired member from the Members drop-down. In the Search Results Map Information, click the Point of Interest Category drop-down arrow and select the desired POI category for this #Click the Point of Interest Sub-category drop-down arrow and select the desired POI sub-category for this particular member. MarketSpace categories display in the search section of the MarketSpace public module. Select the MarketSpace checkbox in the row of the desired category that should be displayed as a MarketSpace category. Note: If the MarketSpace name has been changed, then the checkbox title may not be MarketSpace. Look at the title used in the left-hand menu to determine the title of this column. Note: If selecting a main-level category as a MarketSpace category, then all the sub-categories will display as MarketSpace categories also. 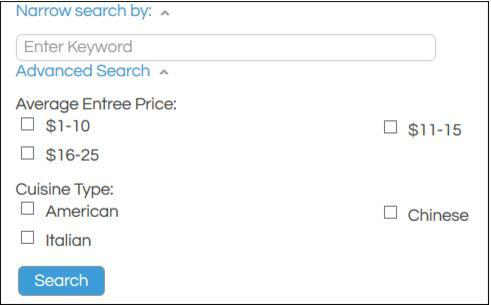 Click Print at the bottom of the category list. The category list will display on the screen. Click Reports in the left-hand navigation bar. Click Contact Information in the Available Fields list. Click the check box(es) for the fields you wish to include in your report. Click Group members by Category in the Extended Options area (if not already selected). The report will display on the screen. Select Print from your browser software. Use standard procedures to print the report. Many options are provided for customizing the selections which allow the software to perform and look the way you want. Membership Types may be created so you can assign Membership Types of your own through a drop-down list when creating or modifying your member’s record. Selecting your members by Membership Type then is an option that is available throughout the software. Menu choices in the Members Only login area may be customized providing the precise experience that you desire for your membership. The “look and feel” of other public website modules may also be customized using menu selections in “Event Options and Settings” or “Business Directory Control Panel”. Settings specific to Hot Deals, job postings, and MarketSpace may also be modified. Social Networking options are available to allow Job Postings, Events, Hot Deals, New Members, and News Releases to be promoted on your Facebook, Twitter, or LinkedIn account with only a few one-time selections. This feature is only available to associations that have upgraded to the Plus edition or greater. Plus edition users or greater may also include credit card as a payment method for event registration, online membership application payment, or when member pay bills online in their Member Information Center. Note that only staff with Administrator Level permissions are able to make these changes. Once created, membership types may be associated to your membership packages, or assigned directly to a member on the member's General Information tab. Enter the name of the new Membership Type. If you are using the v3 public modules, and you have Plus Edition or greater, you can display a membership icon next to members' name in your on-line directory. Click the set icon button. Click Choose File to navigate to the desired .jpg or .gif file. Maximum graphic size is 30 x 12 pixels. Once the file is displayed in the Load Image dialog box, click Close. If using the v4 public modules, you can display a membership type banner for your members on the directory pages. For the desired membership types, click the check-box in the v4 Display column. Select the desired member from the drop-down menu. On the General tab, click the Membership Type arrow in the Additional Information area to select the desired Membership Type. NOTE: Membership Type may be assigned when a new member is created. This selection is available on the second step of the four in creating a new member. Your members have a secure password-protected Member Information Center available through the Internet where they can view and edit their company information which automatically updates the public member listing on the your website, pay bills, interact with each other, submit jobs, advertising, and events for approval, and also view statistical reports. This Member Login area may be customized by you using menu selections in the Setup module. The selections made here determine the permissions that are available for all member logins and also set the maximum permissions allowed for all rep logins, if individual rep logins are used. Click Member Login Area Options & Settings in the General Information area. Select Enable for selections that should appear on the Members’ menu, and select Disabled for selections that should not appear. 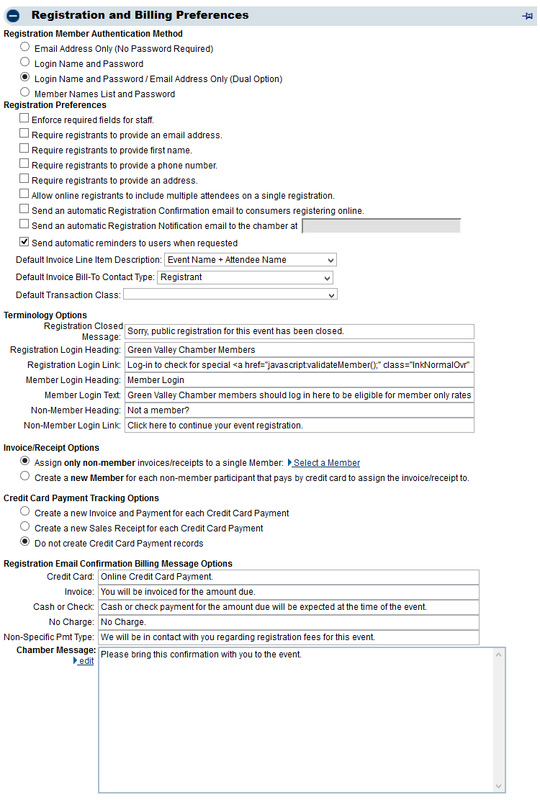 Allow Event Registrations When selected, this enables the rep to register for events using their login credentials on any event with registration available on the public website. Reps with this selection would not be required to login to the Member Information Center in order to register for events. If there is a need to keep a representative from accessing the Member Information Center but still register for events, this selection is enabled and “Allow Login to MIC” is de-selected. Rarely is “Allow Event Registrations” de-selected. Business Info Grants access to the member’s profile including their company name, address, phone number, company email address, website address, fax number, and number of employees. Bus. Categories Grants access to the business categories that the member belongs to. “Read Only” access would not allow changes. “Read/Write” would allow member to change their own category. In the Email Addresses area, select how you’d like the email addresses to appear for member and reps in the Member Information Center. Click the Menu Items tab. Click Add/Edit Menu Section 1 (or Add/Edit Menu Section 2 or Add/Edit Menu Section 3). Each section represents a separate section of the menu displayed in the Member Information Center. Enter a name for the new section in the Place custom menu items under the heading text field. Click Add a New Link. Displayed Link Name - enter the name or text you would like to display for the hyperlink. Website URL - enter the url for the website to which you wish to link. Make desired changes to the text. Note: You can return to the default text at any time by clicking Use Default and then click Save. The Promote Your Business widget will display in Member Information Center (MIC) for those that have a Basic Web Participation package to encourage Basic package members to upgrade to an Enhanced Web Participation package. You can enable/disable the widget and control the message that appears with the widget. MIC Version 4: Promote Your Business and Upgrade Your Listing widgets appear on the Company Information->Profile Summary page. The Upgrade your Listing widget may also appear and be controlled by this setting depending your benefit campaign arrangement with GrowthZone (if any). Click the Enabled/Disabled selection in the Display Upgrade Message drop down. In the Promote your Business section, click Use Custom. 1.Click Setup in the left-hand menu. 2. 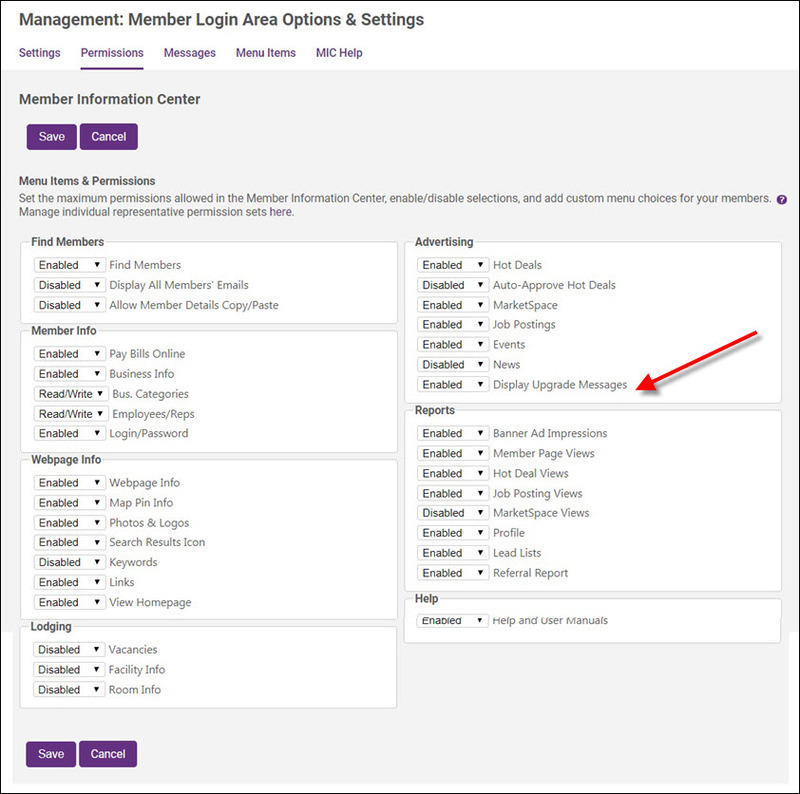 Click Member Login Area Options & Settings in the General Information area. 3. Click the Messages tab. Note: you can enter multiple email addresses separated with a semi-colon. The error received by members and reps that click Forgot Password and incorrectly enter their login credentials may be given a customized message that will give detailed instructions. Click Member Login Area Options& Settings in the General Information area. The MIC Help is pre-populated with several videos which you may use as designed, or you may replace with videos and help text of your own. Click the MIC Help tab. Click Use Custom on either Help Item 1 or Help Item 2. Member Information Center version 4 has powerful search ability in the member directory. Customize what options and filters display and whether include reps in addition to the members in the search results. Select the desired filters and search result options. Enabling your QuickLinks in the MIC search will display in the MIC as Categories. Then your Categories will be labeled as Subcategories, making it easier for members to understand the hierarchy. New Members filter displays a checkbox where those searching would see those with a Join Date of today or 30 days prior. Selecting Yes for Display Representatives in Search Results will display only members in your MIC Directory instead of both members and rep names. If set to No, Rep names and information may still be viewed when accessing the member details page but now the rep names and member names don't have to mingle in the directory. Select the desired additional features or enable/disable the Community Activity Feed. Google Translate makes it possible displays the Member Information Center in the language selected by the viewer. Enabling this selection displays the Translate button on-screen. Member to Member Reviews enables ability for members to rate and reviews each other if desired. Note: No automatic staff notifications when reviews are posted at this time. Social Logins allow members to login with their social login. If disabled, this removes the social login option from your /login page. Allow Enhanced Content for all Members - enables the enhanced web display listing for all members. Request for Proposal Module turns on/off the Request for Proposal menu selection from display in the Member Information Center. ChamberMaster will automatically publish your events, Hot Deals, news, new members, and job postings to Twitter, Facebook, and/or LinkedIn for those that have upgraded to the Premier Edition or greater and have an account on any of these social networking sites. Troubleshooting Social Network Connections Issues with posts not appearing are often solved by disconnecting from the social network service and then reconnecting again. These 3rd party companies will occasionally adjust their code which might cause our connection with them to be interrupted. Simply re-doing the connection often solves the problem. One time selections must be made in ChamberMaster/MemberZone to associate ChamberMaster/MemberZone with your Twitter and/or Facebook account and select which items should be published. Items such as Events, New, New Members, Hot Deals, and Job Postings may be posted to your accounts. Click the Twitter Connect/Facebook Connect icon to connect your Twitter/Facebook account to ChamberMaster/MemberZone. In the Settings area, click the check-marks to select the desired items to publish. Select which calendar(s) should be published. Type the number of days that events should be published before the starting date of the event. NOTE: It will only be published a single time automatically, as duplicate posts can be seen as spam which is why we can't send it twice. Click Post Test Message to initiate a check of the connection and to verify where the post will display. Load your association logo under Setup -> Organization Information< in order to have your logo display next to the Facebook posts. Without a logo uploaded, the post will display a Powered by ChamberMaster logo. Event posting: The Search Description field on configured in Events General tab determines the phrase that appears at the bottom of the Facebook post. This field is populating the event META data which should result in more favorable Search Engine ranking over time. Use descriptive, precise phrases in this field for best results. If no data is saved in this field, the first 160 characters of the Event Description is used for the Facebook post. Search engine ranking is not directly affected by this field. The Search Description field is available to those with v2 or v3 public modules. Event Image: Main Event Photo found on the Events - General tab under Photos and Images is being suggested to Facebook as the appropriate image to use in the event post. When visiting a public event information page, you and visitors may wish to share this event information on your own Facebook page. You can also easily select which of your Facebook accounts (personal or business page(s)) to post on using these simple steps. Find the desired event page on your website. Click Share on Facebook under the Event Options. Select On Your Page from the Share drop-down menu. Select which page you’d like to post on. If connected to the wrong Twitter account by mistake, or in certain troubleshooting situations, you may wish to disconnect Twitter from the ChamberMaster connection. Login to your Twitter account that you wish to have disconnected. If connected to the wrong Facebook account by mistake, or in certain troubleshooting situations, you may wish to disconnect Facebook from the ChamberMaster/MemberZone connection. Login to the Facebook account you wish to disconnect. Click the menu arrow in the upper right-hand corner. Find ChamberMaster on the list. Click the x at the end of the ChamberMaster entry. A variety of menu selections throughout ChamberMaster may be customized with selections of your choosing. Defaults selections exist in these menus already (with the exception of Custom Fields) but you could modify this list by adding or removing selections as desired. Selected when completing the drop screen that appears when a member status is changed to Dropped. A Task may be selected when sending an email or creating a Communication entry. It identifies (for internal use) the subject or category of the correspondence that is being created. All communication may be filtered by Task to view communication across all members that relate to one topic (Task). Assigned to an event so events may be displayed and searched for by their type on the public website. Assigned to a group so groups may be displayed and searched for by their type in the Groups module; helps organize the multitude of groups that may be created. Optional: Used to organize News articles on the public website. Article type is not displayed for the public but allows web designers the ability to display news by type if desired. Used to store any information desired on a Members’ record. Chose from Text, Date, Drop-Down list, Boolean, and Numeric field types. 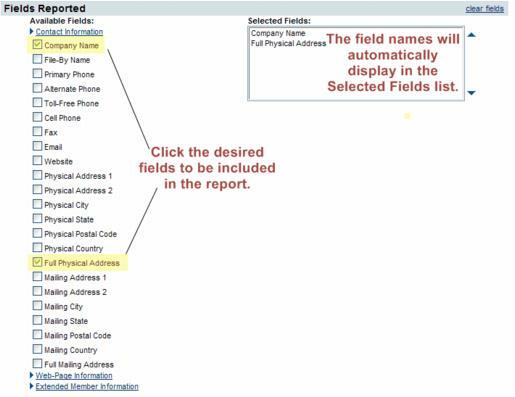 These fields are available on each member’s record, on custom reports, and within custom communication as mail merge fields. Used to store any information desired on a Reps’ record. Choose from Text, Date, Drop-Down list, Boolean, and Numeric field types. These fields are available on each rep’s record and on custom reports. Members->Reps tab, Add/Edit Custom Fields in the Custom Fields area. The “look and feel” of the public website modules may be customized using menu selections in “Event Options and Settings” or “Business Directory Control Panel”. Hot Deals, Job Postings and MarketSpace also have a number of settings that may be controlled. Event types may be categorized to make it easy for visitors to your online calendar to find events of interest to them. Click Events Calendar: View/Edit Event Types in the Information Request section. To create a new event type, enter a name for the type in the New Event Type Name text field and click Add Event Type. To change the name of an existing event type, select the event type to be changed from the Edit Event Type drop down list, change the name in the Change Event Type Name To: text field, and click Update Event Type. To delete an existing event type, select the event type to be deleted from the Edit Event Type drop down list and click Delete. The Event Options and Settings allow you to customize your online Events calendar. Certain registration options may also be customized such as the available authentication methods for member registrations. Click >Event Options and Settings in the Association Options section. Click Event Options and Settings. Open the Registration and Billing Preferences area. Enforce required fields for staff – if fields are marked as required, then when staff enters a registration from the Guest List tab, then the fields will also be required for them as well. Require registrants to provide ________ - these fields will be marked with an asterisk on the event registration screens, indicating that they are required before moving to the next screen. Set defaults that appear when creating event invoices under Billing->Invoices with Batch Type = Event (integrated Billing) or QuickBooks->Event Invoices tab (QuickBooks integration with CQI). Set defaults for credit card payment tracking and invoice/receipt options for non-members. Allow public users to submit events for display: When selected, this checkbox will turn on the “Submit New Event” link that displays on the events calendar on the public website. The general public and members would be allowed to submit events for your consideration through this link. Registration Preferences: Select the required fields needed when guests register online. These particular selections apply to all online event registrations. Note: Some selections are available here and also on the specific event Fees tab. When the selection is available in both locations, the selection on Event Options and Settings is setting the default for all events but may be overridden on a particular event by making a change on the Fees tab. Chamber Message: Type a message that will appear on every event confirmation email that is sent to all registrants. Sponsors: Edit/Create this list of Event Sponsor levels that will be available to assign to your event sponsors on the Events->Sponsors tab. Sponsorship levels created here are available as a default set of levels for each event. When a level is assigned to an event sponsor, that level title, if set to “Display Heading”, will also display for the public above the names/logos of those sponsors on the event calendar on the public website. If the level is set to “Do Not Display”, the level title will not display on the public website but the designated sponsor names will be displayed in the order of their level of assigned sponsorship. When this selection is enabled, website visitors will see links to share the listing/posting on FaceBook, Twitter, LinkedIn or email to a friend. 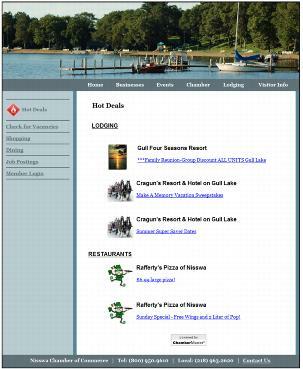 Share links will appear on the member’s website Information Page, Hot Deals, Member-to-Member deals, job postings, MarketSpace items, and on event description pages. Note: This selection is only available when your website has been integrated with the SEO module integration. Select whether individual representative names should be used as search criteria in the online Directory search. See options below in Figure 2. If this selection is enabled, then the General Filter Options: Contact will also be selected. Note: This selection is only available when your website has been integrated with the SEO module integration. When this checkbox is selected, website visitors will have an option to Contact these Businesses when viewing a list of members in the online Directory, whether searching alphabetically, by category, keyword or any other way. This single message is sent via email to the selected businesses. Each request is tracked in the database as an eReferral, just like any eReferral form completed by your internal staff. Use with Require Staff Approval Before Delivery checkbox if you’d like to approve the message before it is sent. Select this checkbox if you’d like to approve the Contact These Businesses message before it is delivered to the member. When a lead is received it will appear in the Web Leads Task List. Hot Deal Settings apply to both Hot Deals (Community Deals) and Member-to-Member Deals. Note: Member to Member deals are available only for those with Plus edition or greater..
Click Hot Deal Settings in the Information area. Display icons in summary list will show the graphic that has been selected in that deal on the public website in the search results in addition to displaying on the coupon itself. Only available with SEO integration. Hot Deal and Member to Member captions allow you to specify your own custom phrase to describe these deals. The custom title will be reflected on the associated public website modules and throughout the software. Website graphics must be designed and replaced by your website designer. Refer to http://kb.chambermaster.com/hot-deals-icon for complete details. RSS Feed limits for deals and member to member deals determine how many deals will display at one time in the RSS feeds. RSS feeds are commonly used to display a easy-glance list on your website home page. Enable Hot Deals Newsletter displays the consumer signup link on the Hot Deals website page. Enable Hot Deals as a public module and Enable Member to Member Deals as a public module control whether the link appears at the bottom of the modules on the public website. 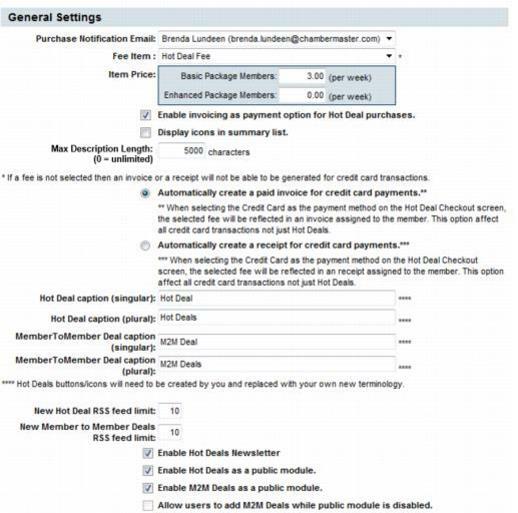 If deselecting the Member to Member Deals as a public module, you can still select Allow users to add M2M Deals while public module is disabled so that members may add deals in the Member Information Center but not have the link display for the public. Charging for deals is an option. If wanting to charge, the options of credit card payment (if integrated) and invoicing are available. A fee item (Type=Member Due) must be created in the Billing or QuickBooks module in order to have the Fee Item selection available here. The fees selected here apply to both Community Hot Deals Deals and Member-to-Member Deals. The Item Price option for Enhanced Package Members will only apply if you have purchased the Marketing Package. If applicable, a fee will be charged per deal for the number of weeks the posting will be displayed. When credit card is integrated with your database, it will always be available as a payment method for deals. It may not be removed as a payment method at this location. Cash payment is not available as a payment method for deals. Fees for deals are charged on a week by week basis – a full week at a time. The week is determined by the number of days – 1-7 days = 1 week; 8-14 days= 2 weeks etc. Click MarketSpace Settings in the Association Options area. Note: If the MarketSpace name has been changed, then the selection here may not be MarketSpace. Look at the title used in the left-hand menu to determine the title of this menu selection. The Default Priority determines the level that MarketSpace items will be assigned when an item is submitted by a member or as the default selection when items are created by staff. Available priority levels are Normal, Silver, Gold, or Platinum. The level assigned to the item determines the order it will display on the public website. A fee item (Member Due) must be created in the Billing or QuickBooks module in order to have the Fee Item selection available here. A fee may be charged per MarketSpace for the number of days the posting will be displayed. Type the price per week here which will automatically calculate a price per day when needed. The payment method for each MarketSpace item may be selected as Invoice or payment by credit card (if integrated). When credit card is integrated with your database, it will always be available as a payment method for MarketSpace items. Cash payment is not available as a payment method for MarketSpace items. MarketSpace items may be set to auto-approve (without your intervention). The More Pricing option that includes a different price for Basic Package Members vs. Enhanced Package Members will only apply if you have purchased the Marketing Package. 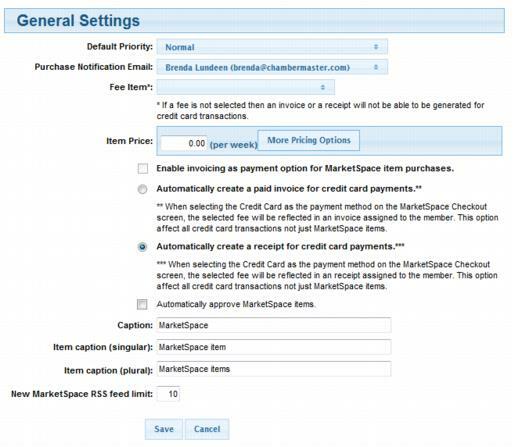 Caption: See “Customize MarketSpace Name” in the MarketSpace section of online help. With ChamberMaster/MemberZone Plus, Premier or Pro editions you have the option to accept credit card payments for event registration, online membership applications, and payment from members within their Member Information Center. Must have Plus, Premier or Pro editions of ChamberMaster/MemberZone. Look in the upper left corner of your database to see what version you have and contact support if you need to look at upgrading. Note:Authorize.NET Direct Payment Method is now supported. With DPM the consumer’s credit card information is transmitted from their browser to Authorize.NET’s servers. This will significantly help those in the process of getting PCI certification. Contact our support team and we'll get your processing enabled so you can complete the setup. View detailed information about using credit card processing in specific areas of your database. Reports to support these credit card transactions are also available. Without any additional selections, ChamberMaster gives options to save your fax output to a file that is accepted by fax software that you might already have installed, like WinFax Pro. Another option prints the output in a format ready to send with your traditional fax machine. These selections are available under Communication->Form Letters. Additional selections may be configured to send your communication piece directly through ChamberMaster via email to your email fax service. (*Note: This requires a separate subscription with one of many well-known internet fax service.) Once ChamberMaster is configured to use your email fax service, faxing your communication can be completed without printing, downloading, or manually faxing. A new selection will be available under Communication->Form Letters. An email fax service, sometimes known as an internet fax service, provides it’s subscribers with ability to receive their faxes via email and typically allows the reverse as well -- sending of emails out to fax machines. This service bridges the gap between the older technology of fax machines, well-established in the business environment and the newer technology of documents transmitted via email. In the simplest terms, when you sign up with an email fax service, you will be assigned a dedicated fax phone number that will convert incoming faxes to email attachments that are automatically sent to your email address. This also works in reverse with most email fax services if the recipient has a physical fax machine and you send a document via email to these fax services; they would be received in their fax machine just as if you had sent them using a standard fax machine. From the Setup menu in ChamberMaster, select General Options & Settings. 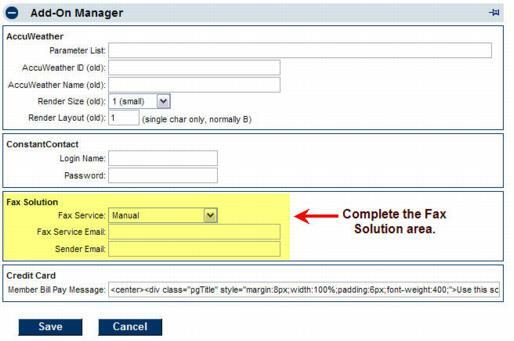 Open the Add-On Manager area and complete the Fax Solution fields. When designating that communication is delivered via fax, the appropriate output will be sent to your selected email fax service who in turn will deliver it to your fax recipients. Which email fax services are supported? Currently eFax, MetroFax, RapidFax, MaxEmail, and MyFax are supported. Additional email fax services may also work if they accept the standard email format generated by ChamberMaster. There are a variety of custom settings that may be put in place. Most of these selections are found by clicking Setup in the left-hand menu. A few miscellaneous selections are identified here. The ChamberMaster/MemberZone member management system allows you to connect to your Constant Contact account to automate updates to your Constant Contact lists based on updates made in the database. Once configured representatives that have been added to the database or specific groups will automatically be added to Constant Contact. Any reps that are disabled within in a group will be removed from their respective lists. Note: Any Representatives that are deleted from the database or removed from a group will still remain in Constant Contact. These contacts would need to be manually removed from Constant Contact in these circumstances. For best results avoid deleting or removing representatives within your database and instead simply disable them within the group. Constant Contact has a special pricing program for Chambers of Commerce see the details here. You must have an active account with Constant Contact to setup and use the synchronization tool. Login to your database with administrator privileges. 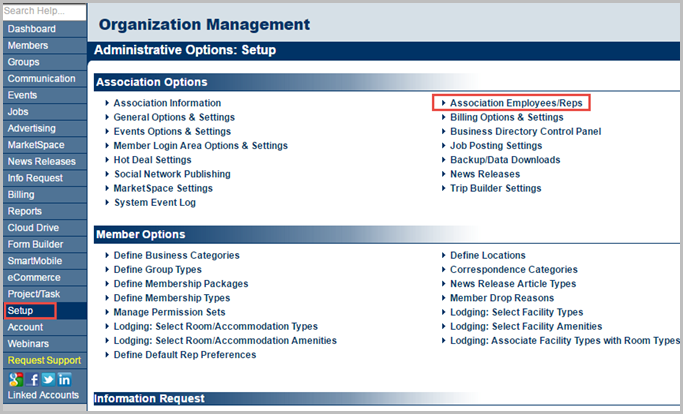 Click General Options and Settings in the Association Information (or Chamber Information) area. Select ConstantContact from the Newsletter Solution drop-down box. In the Add-On Manager area click the blue link Please click here to authorize the Constant Contact connection. Follow the prompts to authorize the database with your Constant Contact account. Choose which items you would like to have automatically synchronize each night. Automatically synchronize membership types daily, Automatically synchronize groups daily, and/or Automatically sync all active reps for active and courtesy members to allow ChamberMaster to pass all ChamberMaster Membership Types, active reps and/or Group updates and additions nightly to your Constant Contact account. To select only specific groups, click the Synch tab in the Groups module. If you’d rather select only certain groups to be synched, then you’ll need to deselect all others on the Synch tab in the Groups module. See Selecting Which Groups to Synchronize below for more info. Going forward, make any additions to these list or changes to contact information in your software. Each night a synch takes place and any added reps will be added. Any reps disabled will be removed. If a rep is deleted from the database they will not be removed. For best results, manage all additions and updates in ChamberMaster/MemberZone only and don't delete any records. Note: Reps that have unsubscribed from your database mailing list will not be included in the synch to Constant Contact. Once the Constant Contact synchronization is setup you will be able to configure which groups are set to be synchronized each night. Note: The groups option must be checked off in step #7 above for any groups to synchronize. At the top, select the Synch tab. All Groups currently set to synchronize will be displayed in a list when you first open this tab. At the top select the Home tab. Click on the group name that you'd like to change the setting for. Check the box to "Synch this group with Constant Contact." Uncheck Display groups set to synch only. Check off the groups you wish to synchronize. At the top select the Synch tab. Next to each group that has the synch enabled you can click the Synch Now button. This will initiate a synch process that will take up to 15 minutes to complete on Constant Contact's end. You can view the Activity report on Constant Contact to see the status of the import. You can manually create a contact list and export it to Constant Contact as well. If automatic synchronization is not being used, or if manual exporting/updating is desired, use the steps here to export ChamberMaster/MemberZone contacts so that they may be directly imported by Constant Contact. Click Communication in the left-hand menu. Click Newsletters / Email Campaigns. Click the desired “Add” selection to mark names to be exported. A summary of your selections will appear in the blue box at the bottom of the screen. Click view mailing list to see your results. Remove any recipients that are not desired by clicking the checkbox in front of their name. Then click Remove Selected Items. Repeat steps 3-6 to add any more desired recipients. Click Create Mailing List when all names have been selected. The Database will allow you to download and save these names in a file that may be imported into Constant Contact. Follow instructions on the screen to save the file with your desired name and location. Remember this name and location for importing into Constant Contact. Why are there fewer contacts in my Constant Contact list than what is showing in my database? A) When the data is pushed over to Constant Contact any emails that are invalid are automatically excluded. Any emails that are unsubscribed within Constant Contact would also be excluded from the final list in Constant Contact. When does the synch happen each day? A) The synch happens between 11pm and 4am Central Standard Time daily. 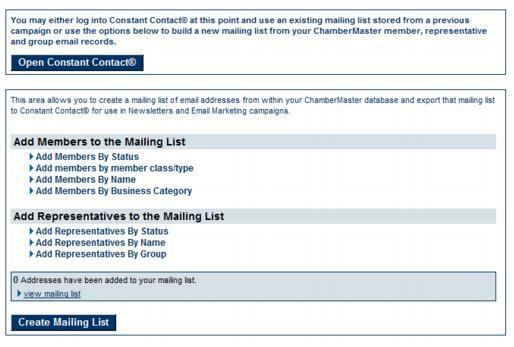 What happens when I change a representatives email in ChamberMaster/MemberZone? A) The representative will be added to anything their previous email was attached to but their previous email will not be removed. If you want their previous email removed you would need to do that directly within Constant Contact. Additionally, you can sign directly into your Votility Administrator account from the Dashboard without needing to enter additional credentials. Integrating your ChamberMaster/MemberZone account with Votility makes using both software solutions fast and easy by only having to log into one place to access the great features of both products. You will need two pieces of information from your Votility account: your Votility Organization ID and your Votility API Access Key. To find this information and integrate with Votility, log into your Votility enterprise management. Use the navigation links on the left to find the "API Settings" page. From that page, copy your Organization ID and API Access Key. 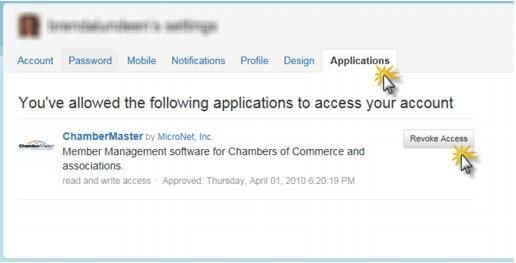 Login to your ChamberMaster/MemberZone database with Admin level permissions. Click General Options and Settings. Open the Add-On Manager area. Click Update Votility Integration Settings button. This will complete your integration, enabling a link to Votility in the Member Information Center for your members and an Administrator login link on the backoffice Dashboard. 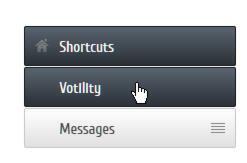 After your Votility integration, members that login to Member Information Center v4 will see a new menu selection, titled “Votility”, displayed on the left-hand Shortcuts menu. Single-sign-on (SSO) has been implemented which means that no additional login is needed to Votility once you are logged into the Member Information Center. After your Votility is integrated, you’ll be able to include a special URL inside of emails and other electronic communication that brings your members directly to the Votility screen once login credentials are entered. Members will login using their familiar Member Information Center login credentials and be immediately brought to the Votility screen, bypassing the Member Information Center home screen, making navigation to Votility very simple. You can now send your members email alerts regarding pending legislation with a link to login to the Member Information Center where they will be provided tools to easily contact their representatives with their opinion. Administrative access to the Votility Administration Center where you can track and measure the success of your campaigns is accessible from the Dashboard screen in the Applications section. This page was last modified on 19 April 2019, at 06:40.